For the people with that airplane journey phobia, and some poorer opinion for Lalu Prasad’s Indian Railways, this is the option! There are some commitments associated with this 990 bucks lottery ticket: you leave on time, reach on time, and get everything and anything in between this! The flight (oops! 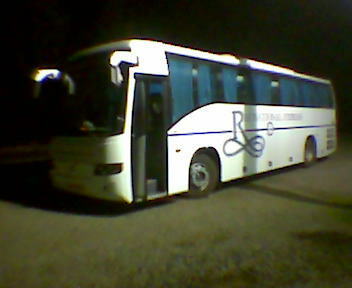 The bus) left sharp at 7 and hit the highway just to stop for its dinner halt after three and a half hours. More than one TV screens, your personalized headphones-thing, movie/music selection, on-board attendants, unlimited eating options, a bagful of complimentary stuffs – a blanket, a pillow, a pair of headphones, some fragrance tissue-sort of a thing, designer sleeping eye-mask, about a billion chocolates (okay if you aren’t impressed yet, this (the Service!) is still rare in buses in India. ), and on and on. An ultimate airplane experience, without flying off the land! Hey hey… if you observed, I actually wrote acomplimentary blanket! Believe it or not, they gave me a blanket and asked to take it along. Now that’s an interesting marketing gimmick, since this is something new in buses (to me, at least). 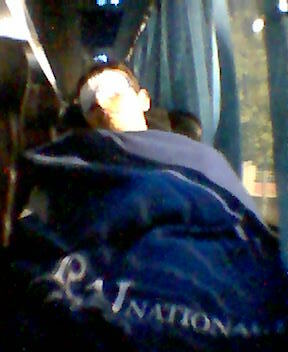 Though the bus reached late by more than an hour, it was Good. The respected government of Madhya Pradesh decided not to cooperate, the roads were all dug every here and there and some scenic accidents sites to add fragrance to the gold, there was little the bus-driver could to drop me on time. So it was a happy ending overall. And the bonus, the bus’s last stop was Habibganj Railway Station - right at the doorsteps of my house!! What else do you need out of your life? I learnt they have online booking system. So next time, before clicking on flykingfisher.com and airdeccan.net, do visit www.rajnationalexpress.in for an unusual change. Related Article: Of all places, why Bhopal?